RIR asked the best Russian language teachers abroad about their methodologies. They compare nouns to cats, infinitives to flour and even take their students to the bathhouse to drink mead. Between October 21-24 Moscow hosted the final round of a competition to find the best teachers of Russian abroad. The winners were Alexandre Strokanov from the U.S., Inna Rosentuler from Israel and Fan An Chin Tkhi from Vietnam. 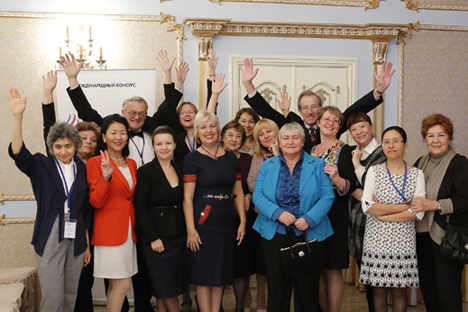 Teachers from more than 50 countries participated in the contest, which was held under the aegis of Rossotrudnichestvo and the Pushkin State Russian Language Institute. RIR spoke with the teachers about how and why Russian is taught today and what is most complicated about it. Teachers in the U.S. have noticed a peculiar interdependence: The worse political relations are with Russia, the greater the interest in the Russian language among U.S. students. "We first noticed a growth of interest in the Russian language somewhere in the beginning of the 2000s," says Alexander Strokanov, Director of the Russian Language, History and Culture Institute at the Lyndon State College in Vermont. "And the more Russia was growing, the more people were interested in it. Today the new Russian-American contradictions are only stimulating more interest. Why? Because many ordinary Americans don't necessarily think like American politicians. Many don't even believe the politicians." Interest in Russia has also grown significantly in China. Lin May, Professor at the Xi'an University of Foreign Languages, says that the Russian language has made it to the top eight most popular specializations, according to the Unified State Exam. "This is a great change. Five years ago no one would apply to the Russian Faculty and in their first year of university we would have to persuade students to study Russian," says May. The opposite has happened in the Balkan countries, where in schools the Russian language is being squeezed out by the popular European languages - English, French, German, Spanish and Italian. The general opinion is that the biggest problem concerning Russian grammar lies in the cases of nouns. In Bulgarian, for example, there are cases, but in countries and languages where they do not exist students simply cannot understand what they are. "I tell my students that Russian words do not resemble bricks, they resemble cats," explains Anna Shaposhnikova, a Russian language teacher in Jakarta. "I ask them: if a cat lifts its tail, is it still a cat? Yes, they respond. And if it lowers it? Yes! The same with the Russian language - words have endings. Then the students understand that the ending is like a cat's tail - it is an important part of the word that changes, while the word remains a word. This helps them understand the cases." In Serbian the grammar is similar to Russian, but the problem, according to Gordana Naumovich, is that many students do not know their own grammar. "This is how I explain what the infinitive form of the verb is to chefs," she says. "Let's say you buy a kilo of flour. Flour is something infinitive. But if you prepare crepes or bread with the flour, then it will become something finite. But for now it is an infinitive. Do you understand? Yes, they respond." Meanwhile, Yelena Chernega, who received the RIR Award for promoting the Russian language in Germany, believes that "the most difficult thing of all is to explain Russian culture." "For example, for students it's difficult to understand why Russian women go everywhere on heels," says Chernega. "This is inconvenient and impractical in daily life, but is curious nevertheless. I once came to school wearing heels and saw that all the girls were tiptoeing about." Usually Russian is not the main language of study; therefore teachers must devise ways of captivating and maintaining the students. And some are very gifted at it. Here is an excerpt from one of Strokanov's open lessons on Russia. "Russia is also a countries of feelings. I have prepared a laboratory lesson for you: Come to my home and see how a Russian lives in America. A very important part of this lesson will be to go to the banya (bath). And when we jump out of the steam room into the Vermont snow, we will discuss the possibility of enjoying the suffering of the flesh and what happened to our soul: Has it dropped to our ankles, as Russians say, or has it soared up to the sky? Then we will return home to relish the taste of the national drink - mead."